Hi Friends: Today's post is a birthday card using a new stamp and die set that I wanted to try. I love these AI Wobblers! Please see below for photos, process, challenges, and supplies. Have a super day! I started by stamping the images onto PRISM smooth white cardstock using Memento Tuxedo Black ink and coloring it with my Spectrum Noir markers. I fussy cut the image, then cut the shaker image using the included die and attached it over the base image with the included mini shaker. I added some Wink of Stella clear glitter to parts of the image for a bit of sparkle. For the base panel, I used a bit of watercolor paper, and colored the sky background and ground using Distress inks, then I added the shaker image to the panel. I used the dies to cut the stars and "Zoom" from black cardstock, added them to the panel, then added some more Wink of Stella sparkle to them. For the background, I used several sheets of the KI Metro Garden paper pad and layered the image over them. (There's some machine stitching there for added interest/texture.) I stamped the sentiment onto the KI paper using the Memento ink and cut it with a banner die & added it to the image panel. 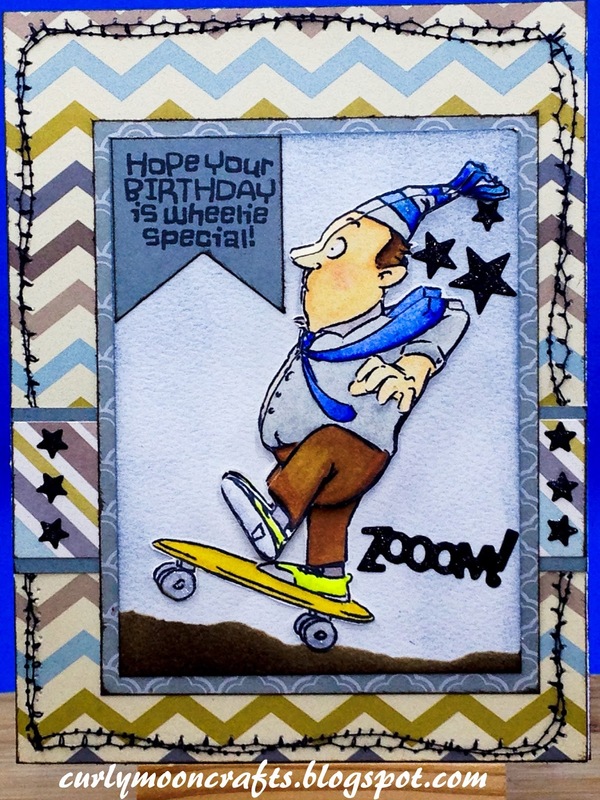 I finished the card off with a few more black stars on the background strip. This is SO AWESOME! Not only the colors are awesome, the stitched lines add SEW much fun in this! Thanks so much for playing Simon Says Stamp Wednesday “Stamp It” Challenge! Beautiful work!